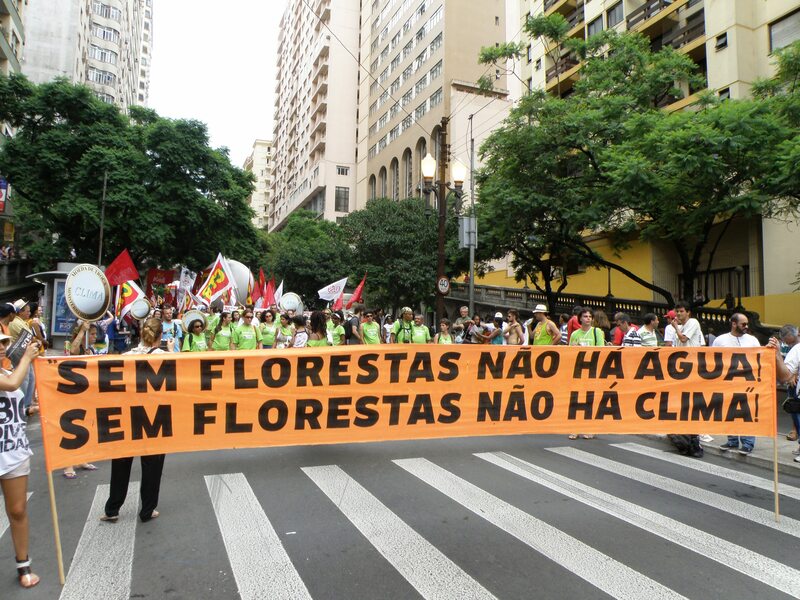 Demonstration for forests: "Without forests there's no water. Without forests there's no climate." 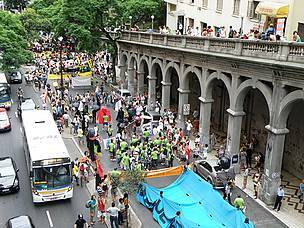 This Tuesday afternoon (Jan. 24), in the sweltering 35 degree heat, thousands of people marched through the capital of the ‘Gaucho” state to mark the opening of the World Social Forum, attended by students, trade unionists, environmentalists, teachers, workers and members of various civil society organizations. Highlights on the agenda include the need for more investments in health and education, the rights of minority and marginalized groups and environmental issues such as the current attempts to alter the Brazilian Forest Law. 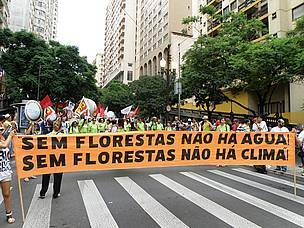 WWF-Brazil took part in the march, which called on President Dilma Rousseff to adopt a different stance from the one she has taken so far, clearly favouring big agribusiness interests to the detriment of the forests and the interests of Brazilian society at large. The text approved by the Senate in December 2011 will now return to the House of Representatives and may be voted on in the first half of this year. Full of retrograde measures, such as amnesty for environmental crimes and the consolidation of predatory activities in legal reserve and permanent protection areas, the Draft Bill, if passed by the Representatives as it now stands, will be sent on to President Dilma Rousseff. Within 30 days of receipt Dilma may sanction or veto the Bill. In her 2010 election campaign, then candidate Dilma committed herself, if elected, to veto any measures that created the possibility of amnesty for illegal deforestation or that might stimulate new waves of deforestation. According to Érico Teixeira, in charge of WWF-Brazil’s engagement in the event, however diverse the Forum agenda might seem, there is a common feeling of indignation among its participants at the unjust situations whereby a powerful minority manages to impose its interests on the majority of the population. “That is clearly what is happening in the case of the Forest Law Reform Bill. In spite of opinion polls run by Datafolha showing that 80% of Brazilians are against the proposed changes, both the Senate and the House of Representatives, with the tacit backing of the Federal Government, have preferred to contradict their wishes”, he explains. The Thematic Social Forum is also addressing issues of great relevance for the international agenda like the manifestations of the populace’s dissatisfaction with political systems that promote exclusion in various countries like Egypt, Libya and Syria, for example, and the strong engagement of the citizenry in protests in Spain, France and the United States. This Thursday (Jan. 26) WWF-Brazil will take part in a debate on the Forest Law reform to be held in Rio Grande do Sul’s Legislative Assembly building starting at 9:00 am. Former senator and environment minister Marina Silva, Via Campesina coordinator João Pedro Stedile, Greenpeace’s Amazon Campaign director, Paulo Adário, director of social movements for the National Students Union, Rodolfo Mohr, WWF-Brazil CEO Maria Cecília Wey de Brito Federal Representatives for São Paulo state Ivan Valente (PSOL) and Paulo Teixeira (PT), along with representatives of the Brazilian Society for the Advancement of Science (SBPC) and of the National Conference of Brazilian Bishops (CNBB) will all be participating. President of the Republic Dilma Rousseff received an invitation to attend but her staff has yet to reply. 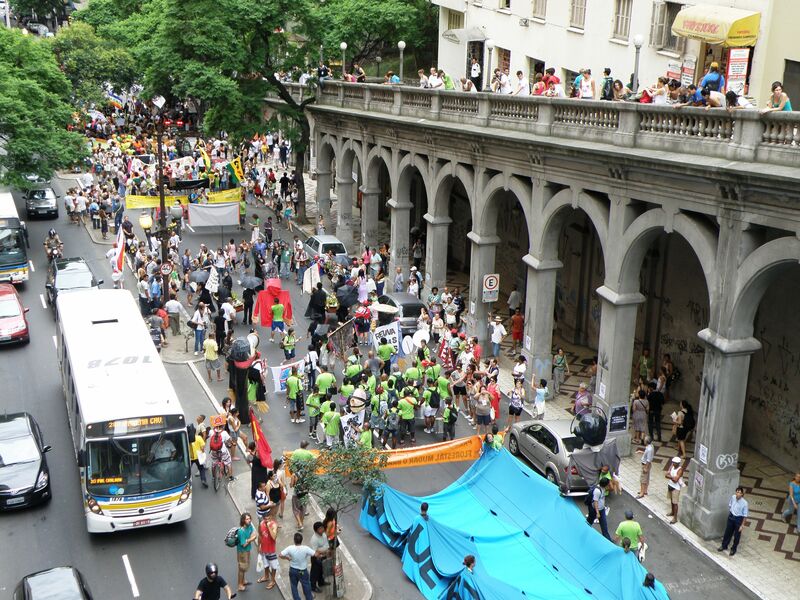 Huge crowd took the streets of Porto Alegre. 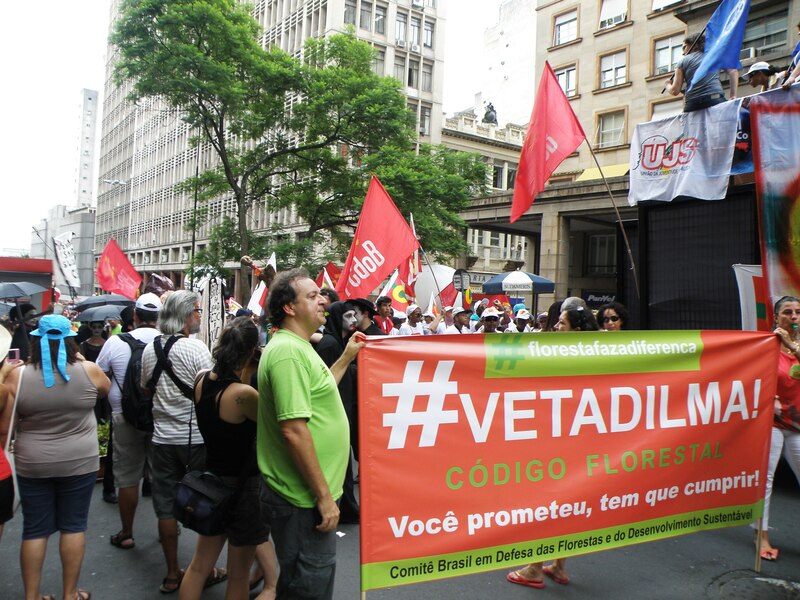 Protesters remembered president Dilma Roussef's campaign promises.